Image from 1917 Suffolk Chronicle and Mercury newspaper. 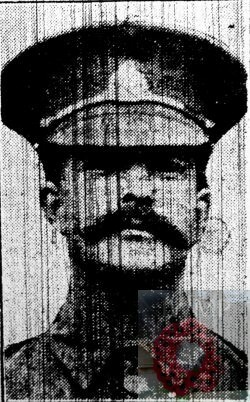 Died: 22nd January 1916; age 31; KiA – mine explosion. Served 14 years. Residence: 76, Richmond Road, Ipswich. Enlistment Location: Ipswich; age: 21 years. Storekeeper to the 2nd Battalion in times of peace. 1891 195, Bramford Lane, Ipswich. George was 5 years old and living with his parents & brothers. Henry Abbott, 34, a General Labourer, born Whitton, Suffolk. Ellen Abbott (nee Copping), 33, born Ipswich. Charles James Abbott, 3, born Ipswich. Clifford Walter Abbott, 1, born Ipswich. 1901 76, Richmond Road, Ipswich. George was 15 years old, a Stay Steel Cutter. He was living with his parents & siblings. Henry, 45, a Gardener – Domestic. Ellen Eliza Abbott, 3, born Ipswich. Frederick Walter Abbott, 1, born Ipswich. 1911 Barrosa Barracks, Stanhope Lines, Aldershot, Surrey. George was 25 years old, a Soldier, ranked Private in the 2nd Battalion, Suffolk Regiment. Soldiers’ Effects to Henry Abbott & Ellen Abbott – parents. Dazed and confused, command was quickly regained. The War Diary noted that “the garrison of trench 28 immediately opened rapid fire” as the men awaited the counter attack they felt sure would come. Lieutenant Dix, finding none of his men had survived the explosion, took what men he could find and immediately manned the right hand lip of the crater against attack. They waited for the enemy, but thankfully, they nor their artillery came. The official figures for killed wounded or missing that day will probably never be known. 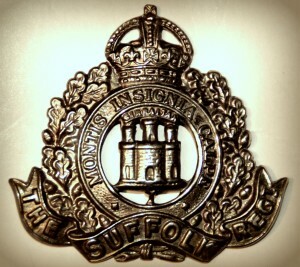 The official figure now, is 45 Suffolk men killed that day; all of whom were privates and NCOs. No officers of the Battalion are recorded as being killed that day.